Step into a holiday fairy tale with this picturesque Advent calendar featuring King Ludwig II's iconic Bavarian castle. With Neuschwanstein's turrets cloaked in a blanket of snow and flanked by frost-spangled mountains, this pretty picture comes complete with a regally clad young couple standing beside a glowing Christmas tree. As December's days pass, open each of the twenty-four die-cut windows to reveal a sleigh, a swan, an angel, a spindle, and more. 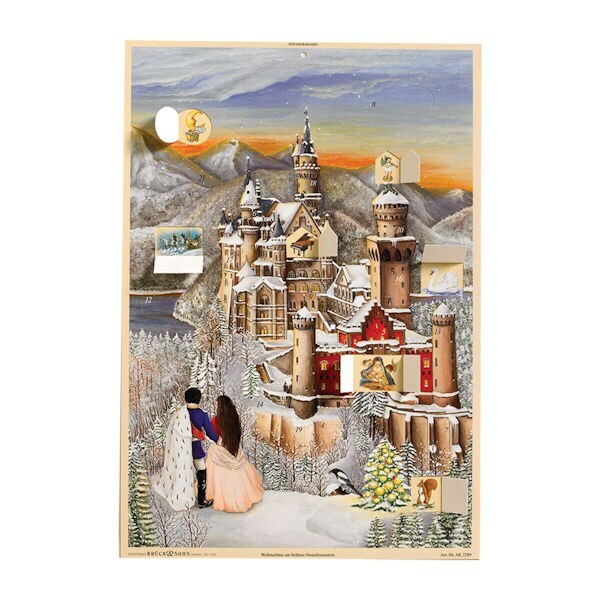 Measuring 10"x14½", this quaint Advent calendar will lend an old-fashioned storybook air to your holiday season.